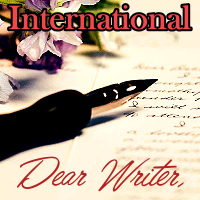 November is National Novel Writer's Month and this year I thought it would be fun to send out mid-month encouragement and inspirational letters to fellow NaNoWriMo participants. This is also a forgiving swap, so it will be open to newbies and those with 4 or higher scores. For this swap, you will send 1 letter to 2 different swap partners internationally. The letters should be encouraging, friendly, and personable--think of yourself and your struggles as you write your letters, you may just encourage yourself! You will have 2 weeks to send off your letters so that they can be received before the event ends. Hopefully, this gives you plenty of time to write meaningful letters without cutting into your own novel writing time. Your letter should include things such as: why you are participating, what this event (or books and writing in general) mean to you, some encouragement to your partner to keep writing! You don't have to be participating in NaNoWriMo to join! Share your writing experience with your partner, your favorite genre, your love of books. Share anything, but be encouraging. Be sure to include your username on your letter! If you don't, your swapper can't rate you. NaNoWriMo is a writing challenge that begins November 1st and ends November 31's. This challenge consists of thousands of writers (both new and old) sitting down to write 50,000 words in that month! To find out more about NaNoWriMo please visit NaNoWriMo.org. Partners have been assigned! Happy writing everyone, and good luck with NaNoWriMo! Hi guys! My letters have been sent to my partners. There has been a CRAZY fire up here, so my post office may be a little slow, but you should get your letter shortly! I hope everyone's writing is going well. We have a little more than a week left. Don't get discouraged if you're not doing too well, just keep writing!